I have started making my memory quilt. 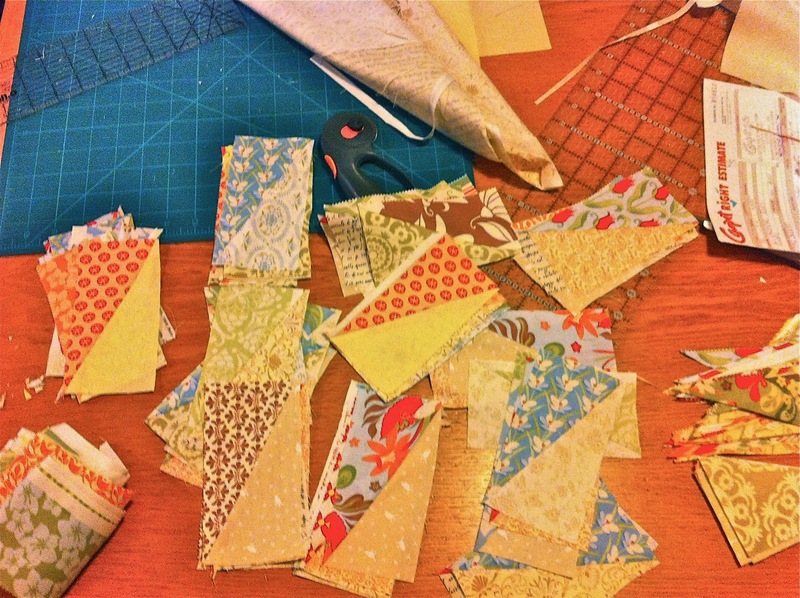 There are many ways to approach a memory quilt – you can use scraps of fabrics associated with what/whoever you’re making the quilt to remember. Or you can use a block design or, indeed, design your own block to incorporate your particular memory theme. I’m not doing that, however. Some time ago, I bought a roll of Moda end of roll scrap strips. These are (although I had forgotten this crucial detail in the intervening time) strips of uneven width and length, comprising roll ends of various patterns of fabrics. The fabrics I got are lovely, pastelly, 50s-ish patterns. About a year later, I bought a selection of cream and near-white prints which may (or may not) read as plain over a surface area as big as a quilt. My intention was to make a quilt built of rectangles divided diagonally, with a 50s-ish print on top and a plain-ish print on the bottom. I will then machine shadow-quilt in diagonal rows just inside the plain half of these rectangles. Most of the quilting will be straightforward stitch. But some of it will be words. Phrases. Memories of my grandmother. I had, however, forgotten that the strips vary in width. My intention was to do rectangles of 5″ x 2″. Indeed, it turns out this is a lot smaller in actual *fact* than it is in my imagination. But because the strips vary in width, I can’t guarantee the 2″ dimension – only the 5″ one. 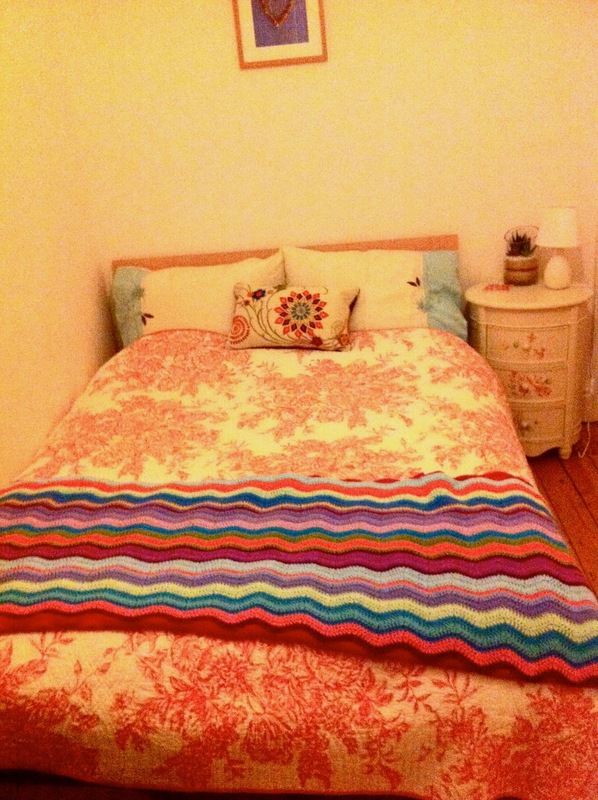 In order to cover a double bed, I’d have to make 288 5″x2″ rectangles, and that’s a lot of rectangles. Potentially a very busy quilt indeed. So far, I’ve made 80 odd. When I’ve got to 144, I’ll lay them out and see just *how* busy it looks. 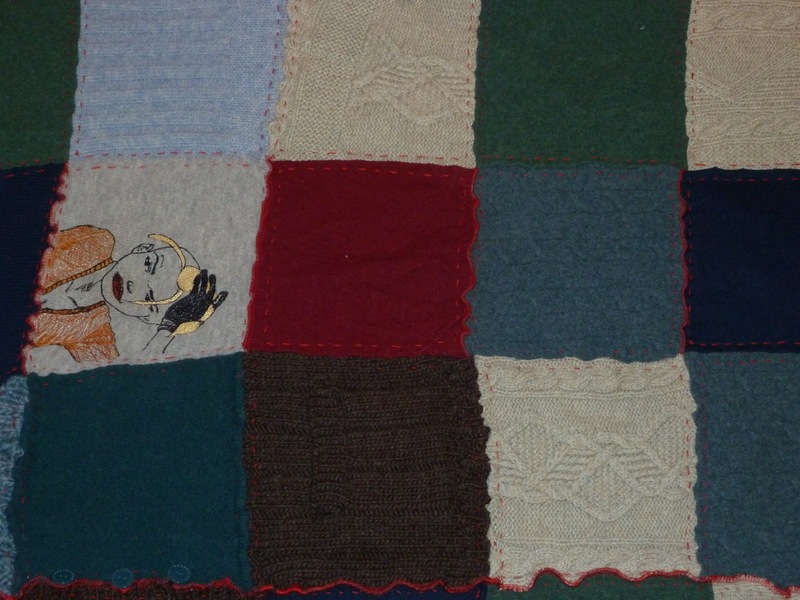 If it’s too painful to behold, then I’ll convert the quilt into a strippy – one strip of rectangles against a strip of something – probably the fabric I’d intended for the back. That way, I can preserve the quilting idea which was, rather the point of the thing. All of which is more of an excuse to post some photos of messy fabric, rather than a coherent post. So here’s the New Year’s Resolution. Like many people, I suspect, I’m not much of a one for resolutions. Which is to say that I’m no slouch at coming up with them. I’m just considerably bad at sticking to them. So don’t expect this one to be any different. It’s not even a *real* resolution. More a statement of consideration of intent. The possibility of a perhaps, if you will. I’ve seen a number of Granny Square a Day blankets, recently. And that’s where my idea starts. I don’t want to do a granny square a day – much as I love a good granny square, even I think 366 of them might be overkill! 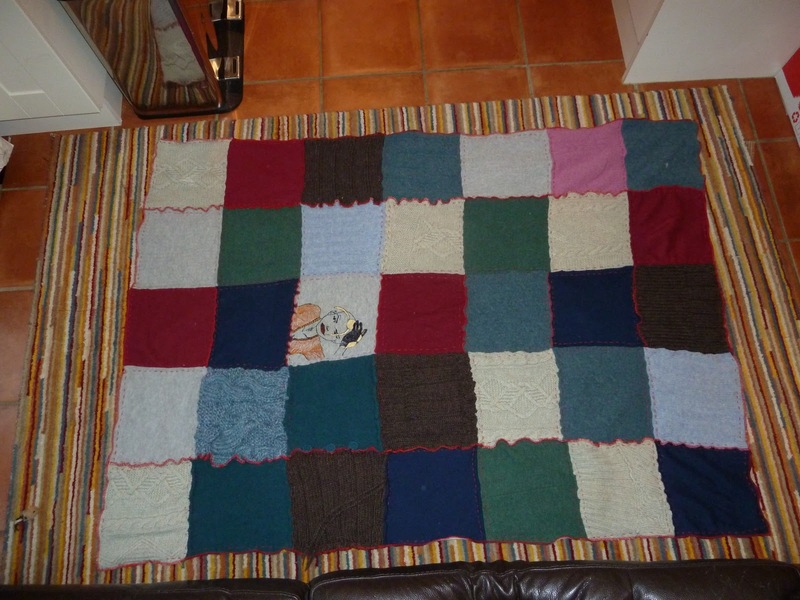 But I do think it might be interesting to do a Square A Day – not necessarily a crochet square – sometimes knit. Sometimes maybe even sewn. But a Square A Day. If it is crochet it will explore different blocks. Acknowledging that life is busy, and commitment variable, though, mine will be a Square A Day Ish blanket. If commitment is *really* variable, it might be a Square A Day Ish drinks coaster – let’s see! I’ll start tomorrow. Maybe. There will be pictures. Definitely. If I do it. OK. I’ve got to be honest, I didn’t so much write a pattern from scratch as make two things from existing patterns, and smash them together to make a new, different thing. But it took some maths, and some working out, and a *little* bit of frogging, and everyone’s got to start somewhere, right?!! 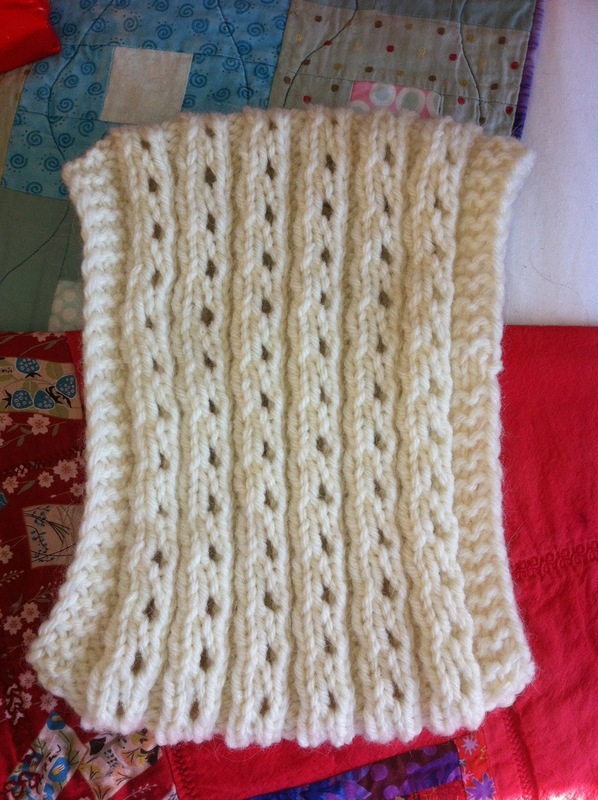 This was born from my eldest daughter’s often expressed jealousy at my own cowl. On a Christmas Eve trip to Hobbycraft (spit!) 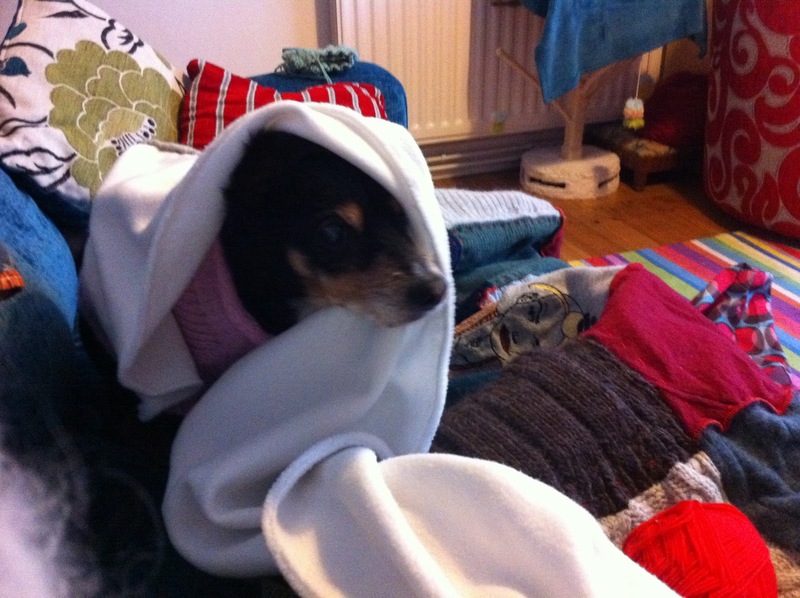 she was ooohing and aaaahing at the softness of a Wendy wool/alpaca blend aran weight yarn, and I thought …. 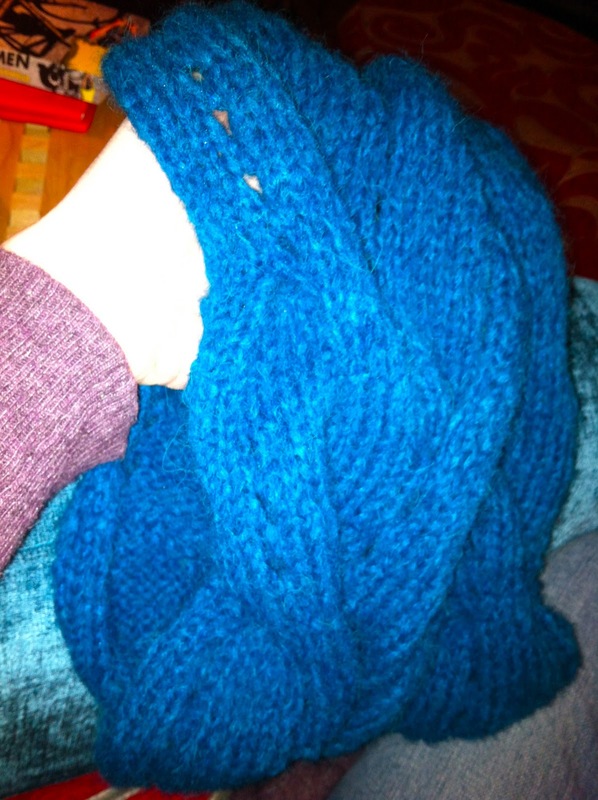 well, it *would* knit up into a lovely snuggly cowl…. and the very next thing I knew, it was in my basket. 8CF – slip next 8 stitches onto cable needle and leave at front of work. Knit 8 stitches, knit the 8 stitches from the cable needle. 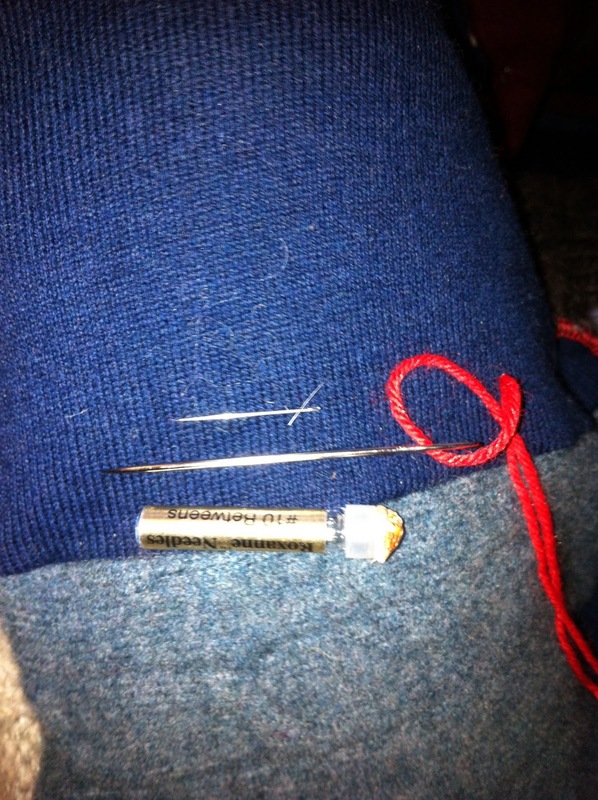 8CB – slip next 8 stitches onto cable needle and leave at rear of work. Knit 8 stitches, knit the 8 stitches from the cable needle. 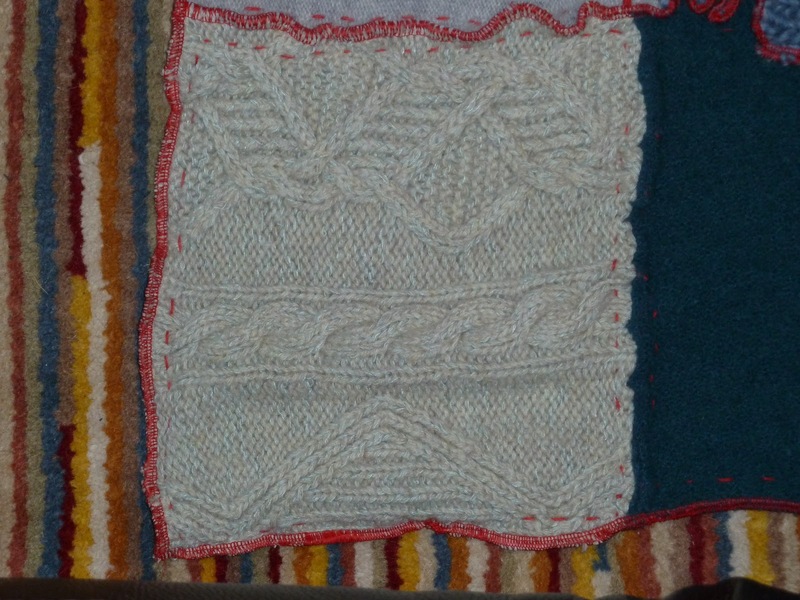 Row 1: knit to end. Next row: Cast off knitwise. Join short edges, to form a loop. Darn in loose ends of yarn. And that’s it!! My first pattern – I do hope someone else makes it… will you send me photos, if you do? I wanted substantial parts of this Christmas to be home-made. And the bits that aren’t homemade are, by and large, vintage. It just chimes beautifully with the way this year has been, for me. I can’t remember if I mentioned it, but this quilt had no central layer, and is backed with microfleece. It’s heavy and dense and snuggly warm – just as well, as my son’s bedroom is one of the coldest rooms in the house. 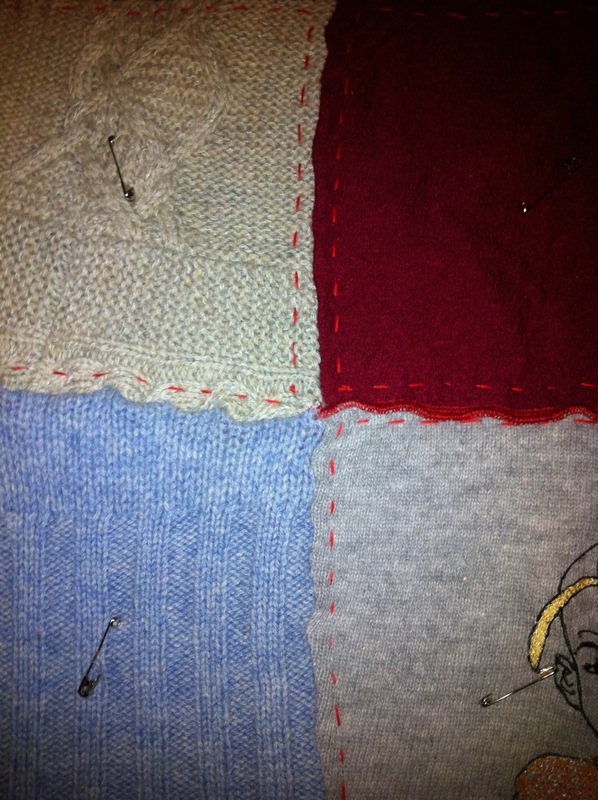 Instead of simply tying the quilt, which was my first thought, I decided to outline quilt each square, using sock yarn. 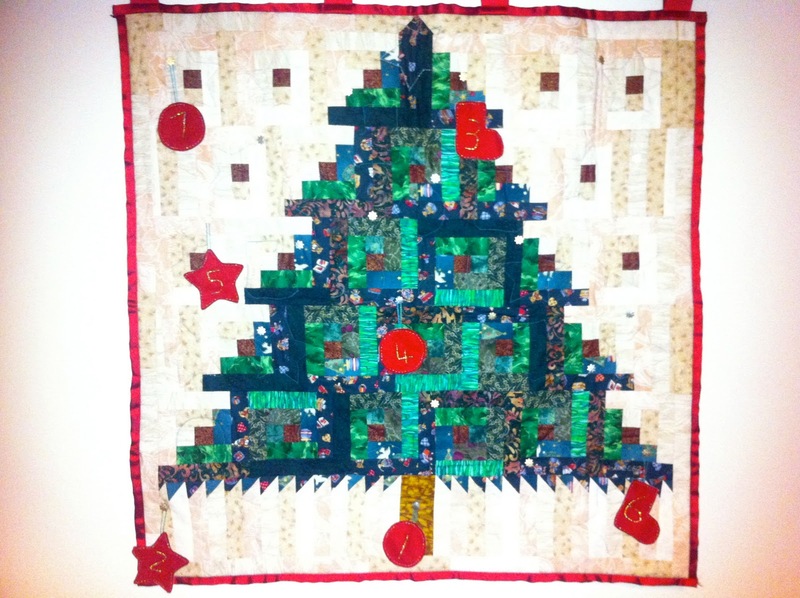 I wanted it uneven and hokey looking – nothing too polished, in keeping with the ‘upcycled’ nature of the whole quilt. 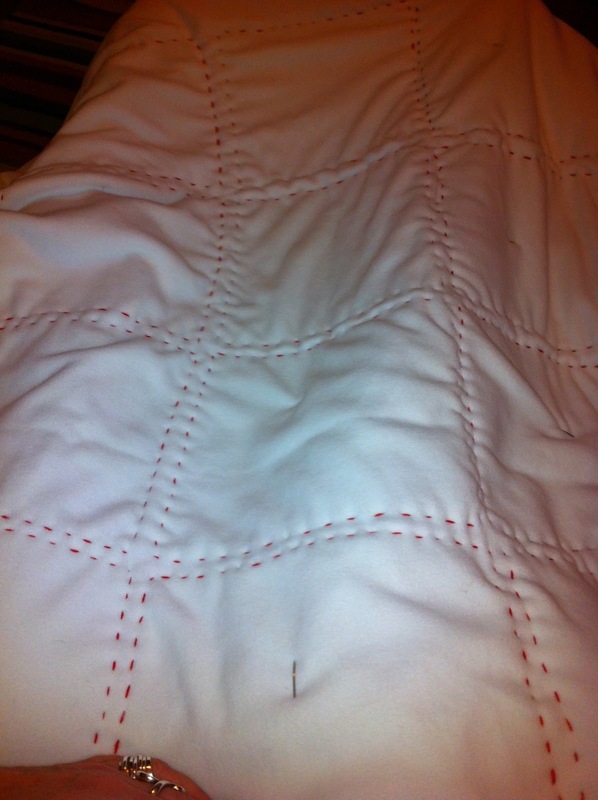 So I didn’t mark the quilting lines. 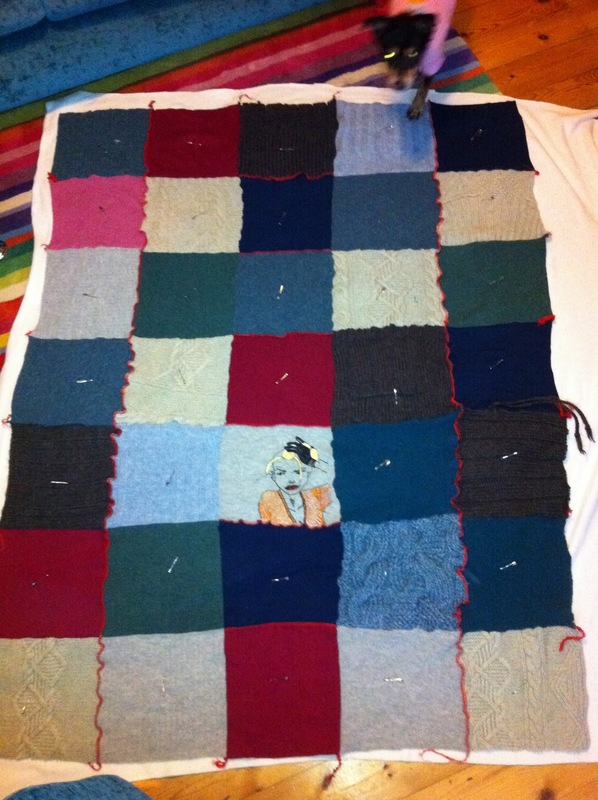 I didn’t even baste it – I just pinned it with malenky great big quilting safety pins… Which meant that the back wouldn’t stay flat by itself, and so in order not to end up with a blocky, wrinkly backing, I laid the whole thing out on my draughty wooden floor, and quilted it in situ. Normally, when I’m hand quilting, I use a size 10 between quilting needle which is, tip to tip, slightly smaller than 1″ long, and very fine. For this quilt, I used a size god-alone-knows yarn darner, which was about twice as long and four times as thick as my normal quilting needle. My normal quilting needle is the top one in the picture over to the right. For scale, that’s a cat hair it’s resting on! The needle I used for this quilt is the threaded one just below it… Ordinarily, you insert a needle in the tiny gaps between the threads of a fabric. Microfleece doesn’t have any such gaps being, essentially, melted plastic and not woven at all. 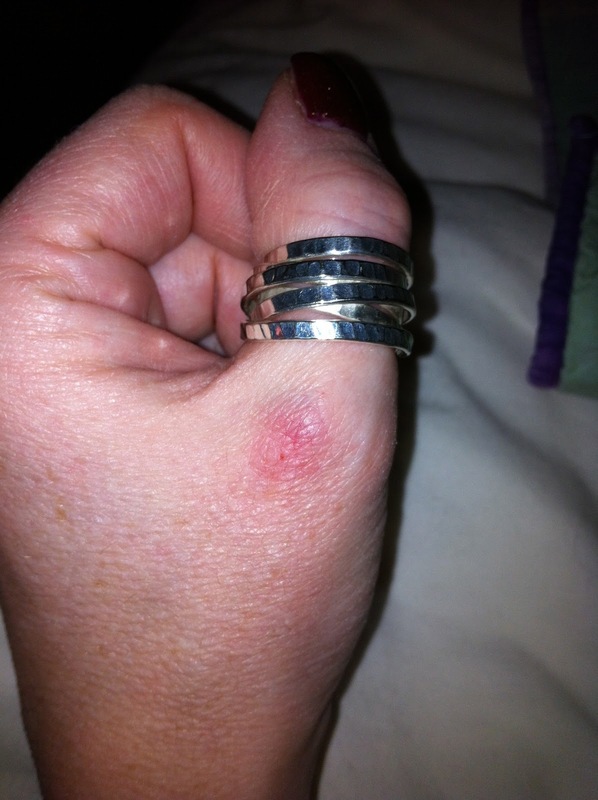 So it required some force to get the needle through, and it often landed on the thumb knuckle of my non-needle hand. Resulting, I have to admit, in a fair amount of swearing and a totally unreasonable amount of Twitter whingeing! A substantial amount of this had to be done while my son was at home, which involved locking myself into rooms in the wee small hours of the morning, and the long dark evenings, with threatening signs taped to doors… And then being very tolerant when the animals wanted to get involved. The dog is a very old lady, and likes to snuggle up under a blanket. She is the biggest fan of my knitting/quilting activities! 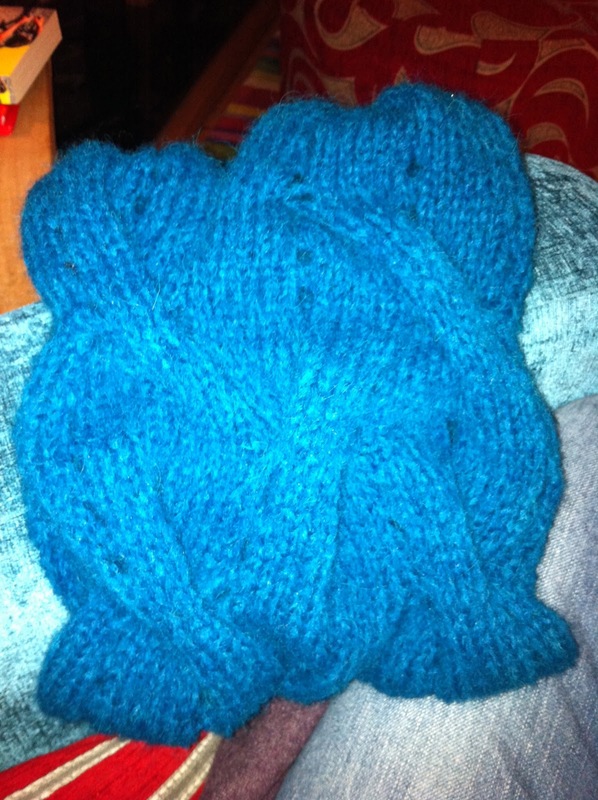 Other Christmas crafting has included knitting. I decided late on that my mother needed an additional something under the tree, so I threw together a cowl using an aran weight wool yarn that I’ve got lying about (who hasn’t…). I’m quite pleased with the result, although it’s a *bit* big for me: being new, it’s quite stiff, but I’m hoping it’ll soften down with wear. The pattern was an online freebie, from f.pea, and knitted up very quickly. I may do it again, in a lighter yarn, and see if that makes it lacier. I prefer my own cowl, I have to say…! So that’s Christmas about done, I think. I hope you all have a lovely time! The problem with this time of year is that there are so many calls on my time, and so many secret projects, that it becomes difficult to find time to make anything that it’s safe to show you! One thing I *can* show you is this monster, which I made for my nephew’s birthday a couple of weeks ago. I also gave him some story blocks, painted by my friend Siobhan, who is not only an award winning journalist for BBC Coventry and Warwickshire, but is also a very talented artist. She makes things under the name Matilda’s Mum, and really ought to have a website of her own, to link to. 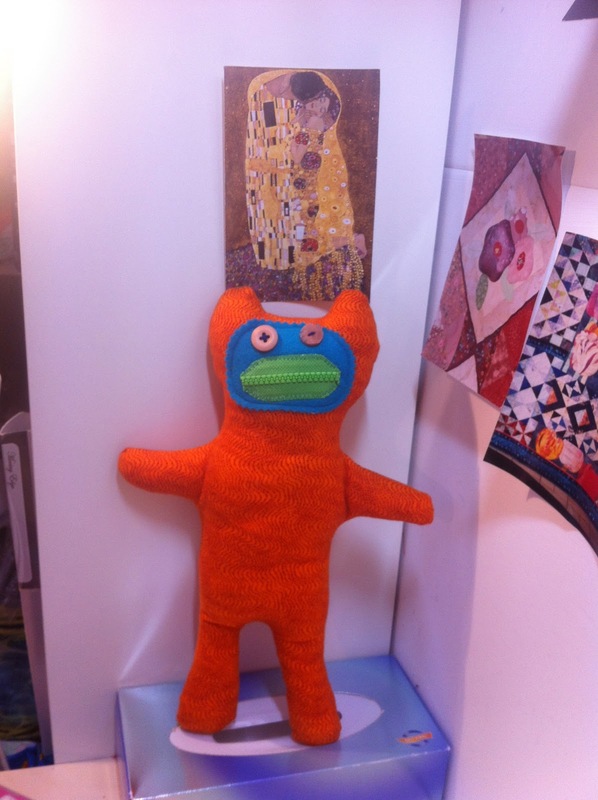 Anyway, she made the story blocks (which I foolishly didn’t photograph) and I made the story monster. The deal is, when my nephew can persuade the story monster to sit down and be quiet (with his mouth zipped, see?) then Mummy or Daddy will make up a story for them… The monster was a huge success. Mummy and Daddy weren’t so sure about their ability to spin a yarn on demand, but there you go! The monster is standing on a box of tissues in my workroom. I took a couple of pictures of that, too, for a friend on twitter. 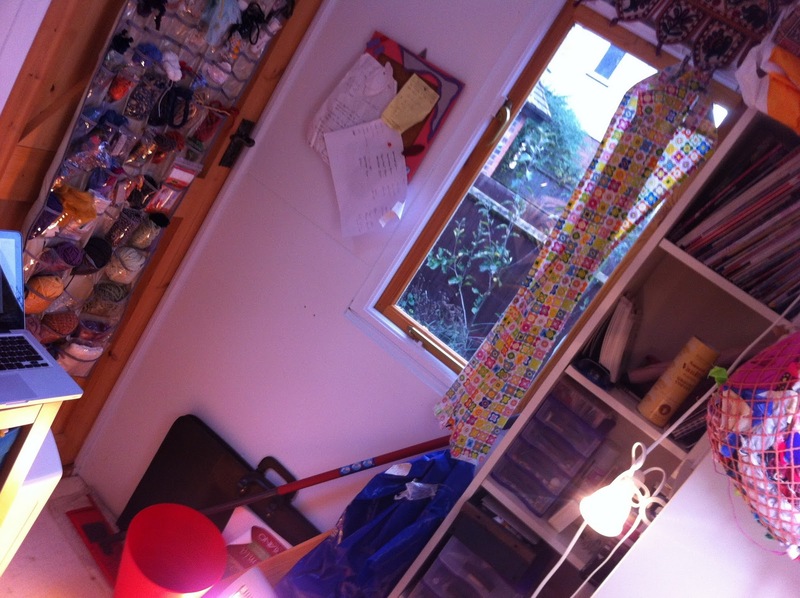 It’s a custom built work room, in my garden. It’s effectively a *really* smart shed – with fully plastered and decorated walls, two double glazed windows and a front door! It has full electricity (obviously) but no water. I dye indoors! It looks like chaos, but it is, in fact, quite tightly organised. The cutting/design table is just visible (under a cutting mat) in the lower lefthand corner. That’s at waist height, and has storage boxes underneath for fabric and some yarn. It also has drawers with all my dye stuff – chemicals, fixatives, and salt. In front of the cutting mat is a miniature ironing board, with a big bundle of felt on it. The hanging basket to the left of the zigzag shelf is full of zips, elastic of various types, and binding tapes. The sewing machine sits on a Horn cabinet which also has storage for thread and various notions. 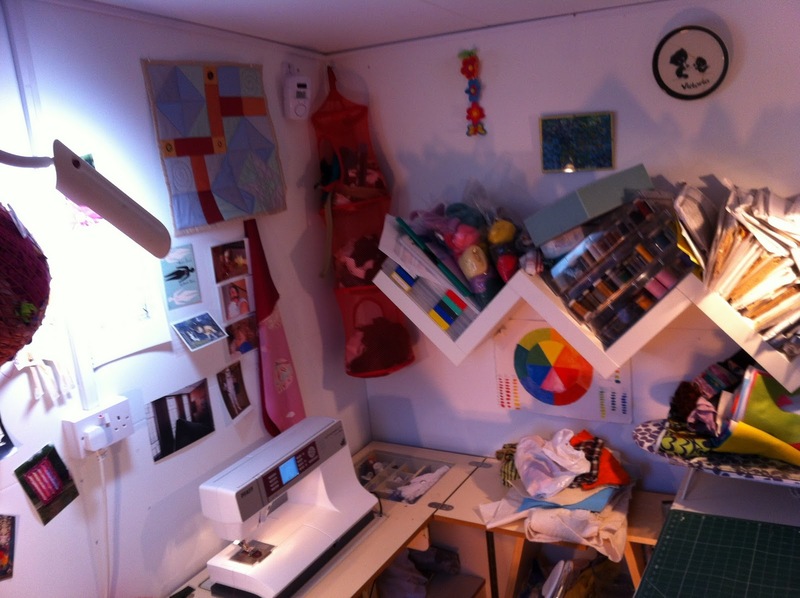 The zigzag shelf contains boxes of thread, dressmaking patterns, and my own design patterns all filed away. It also has dyed wool tops and a felting block for needle felting. The walls are stuck all over with postcards, favourite pictures and various design inspirations, which I refresh from time to time! This is the other end of the shed. The net bag in the lower left hand corner hangs from a bookcase, above the end of the Horn cabinet. It is stuffed with usable sized scraps of fabric from several years’ worth of projects. My friends delight in raiding the scrap bag – and Penny (from Rats as Big as Cats) has made beautiful things using my scraps! There are two bookcases, in an L configuration. They hold quilting books, surface design books, dressmaking books, various art and textile magazines I’ve subscribed to over the years, drawers of fat quarters (quilting fabric), drawers of buttons and beads and embellishments, index cards of dressmaking notes dating right back to my youth and all sorts of useful oddments – freezer paper, dissolvable stabiliser, tracing paper, and so on. They also hold some of my art equipment. The blue bag is a roll of interfacing. The back of the door has a hanger of pockets which hold any number of embellishments – ricrac, chord, braid, ribbon, decorative yarns, and so on. And then we’re back to the cutting table. So that’s where I work. And the final thing to show you this post is actually not my work, at all. This wall hanging was made by Pat Nicholls. I bought it at an exhibition in 2002, or 2003. 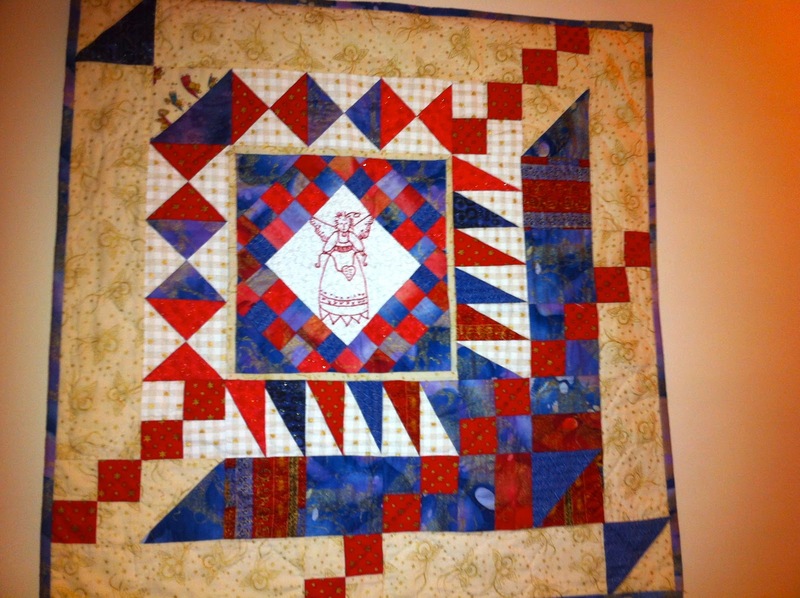 It’s a lovely redwork angel surrounded by a variety of red and blue borders. I love it. So, these are two little owls. They’re made of commercial felt, based on a picture I glimpsed on a website somewhere, and I genuinely can’t remember where, but I think the person who posted them had taken the idea from the Christmas edition of Prima magazine, because I’ve seen something very similar there, too. Apart from it being nice to sit and sew something cute(ish) in front of the TV of an evening, these have been an experiment in hand embroidery. The blue one was my first attempt, and not terribly satisfactory. The purple one has, I think, got a little better…. I will probably make a few more, since they only take a moment or two. And, of course, it’s Christmas. This year, we have unearthed our advent calendar. The children and I made this when they were really very small. The background is a log cabin quilt: a number of ‘shades’ of white log cabins built around a traditional red centre, with the tree made up of green log cabins. The hanging has 24 star shaped gold buttons, and the numbers are either baubles, stars or Christmas stockings, cut out from red felt. I sat the small children – Dan and Daisy – down with some squares of white felt, and a red fabric pen, and let them draw Christmas pictures. I guess they were two years and one year old, at the time – possibly three years and two years, but whatever. 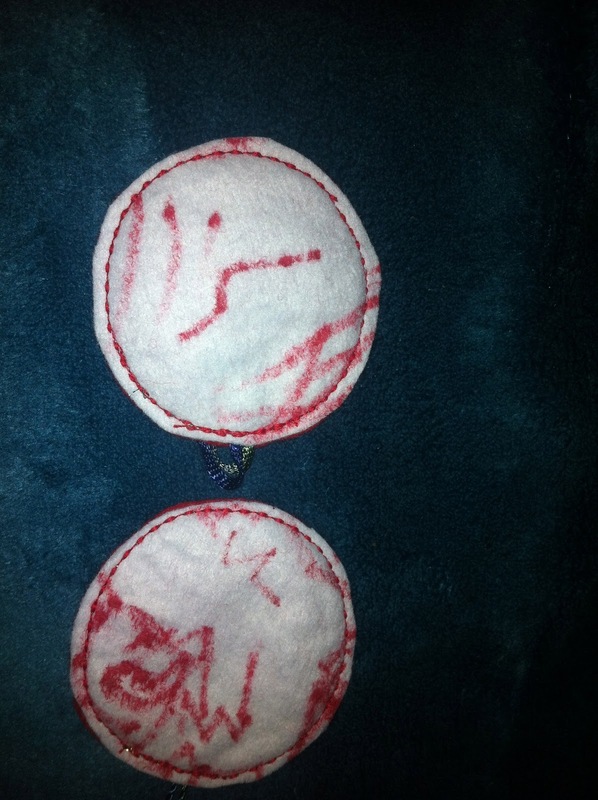 Then I cut the shapes out of red and decorated white felt, and stitched them together with a decorative machine stitch. And Moo, who would have been eleven or twelve, wrote the numbers on, in gold silk paint. We used it every Christmas from then until we moved to this house, when it got lost and I thought I must have thrown it out by mistake. I was heartbroken to think I’d lost such a treasure. But it was unearthed when I emptied a storage crate, earlier this year – I think we’re all very happy to see it, and it certainly feels more like Christmas, to have it hanging in the living room. 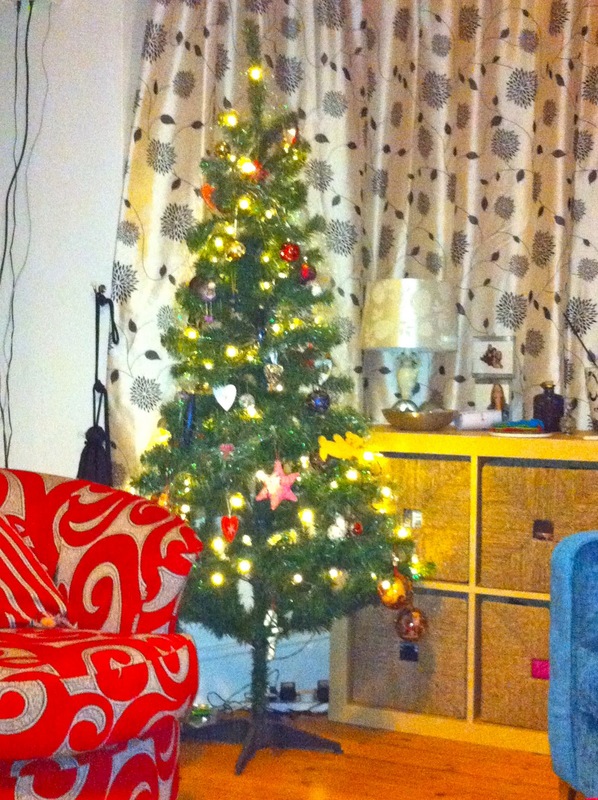 Every year, I practise letting go of my control freakish design prejudices, and absent myself from the tree decorating. Left to me, it would be themed and minimalist – perhaps no more than lights and some angel hair – but the children still enjoy loading it with the baubles we’ve accumulated over the year. So I poured myself a gin, and left them to it… They haven’t done badly, I have to (grudgingly!) admit. I think the fact that I’d spent the weekend on a meditation retreat at a buddhist centre in Derbyshire definitely helped with the letting go, too! 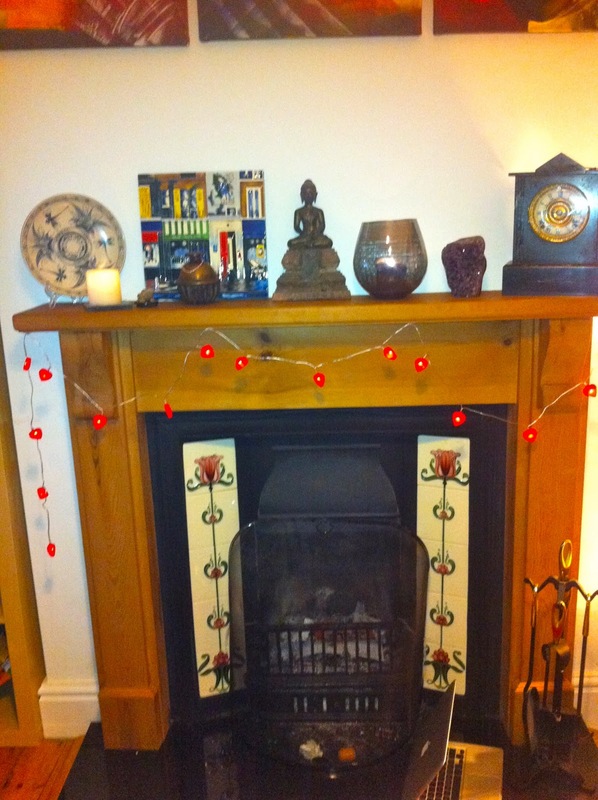 I’ve finished off the decorations, this year, with some heart-shaped fairy lights over the fireplace. I quite like these, actually – they may stay. 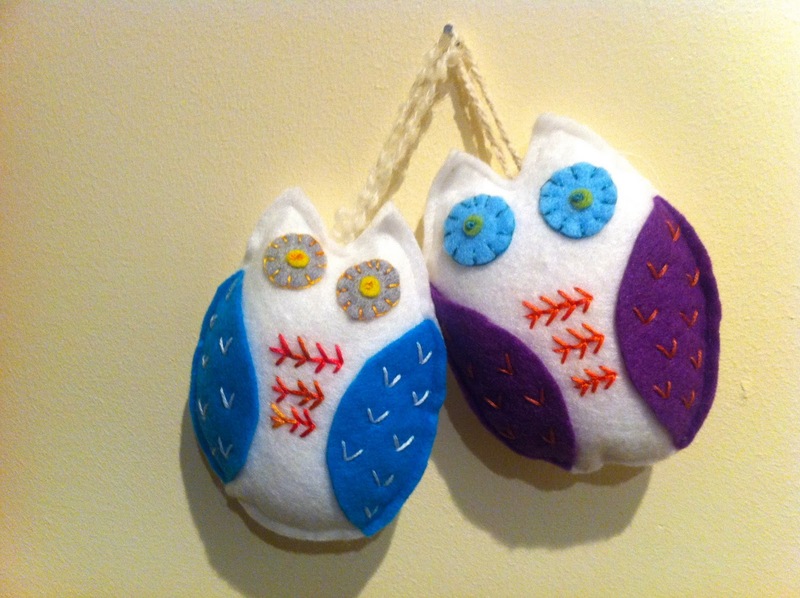 I might even make more owls to hang amongst them, in the manner of bunting. Although, of course, when I finally get round to ordering some more firewood it will probably be way too hot there for anything so meltable. And that’s it for Christmas decorations, chez nous – I’m not a big fan of the season, and we’re the wrong faith for the celebration. I will bring some mistletoe in on the 21st as part of our solstice celebrations (not that we’re that faith, either, but why would you miss an excuse for mulled wine and sausages cooked on the barbeque??). But Christmas *is* an excuse for Christmas markets. On Sunday, I found myself with some time to kill and so I headed to the Manchester Christmas market. We lived in Manchester for – oh, about 20 years, and so it’s a bit like homecoming to wander around the city centre. The market there is much bigger (and better) than the Birmingham equivalent, and has German, French, craft and art sections, as well as the obligatory gluhwein and nyummy continental food! I grew up in Germany, so always enjoy the opportunity to stock up on German delicacies – lebekuche, and gluhwein and bratwurst – just scrummy! 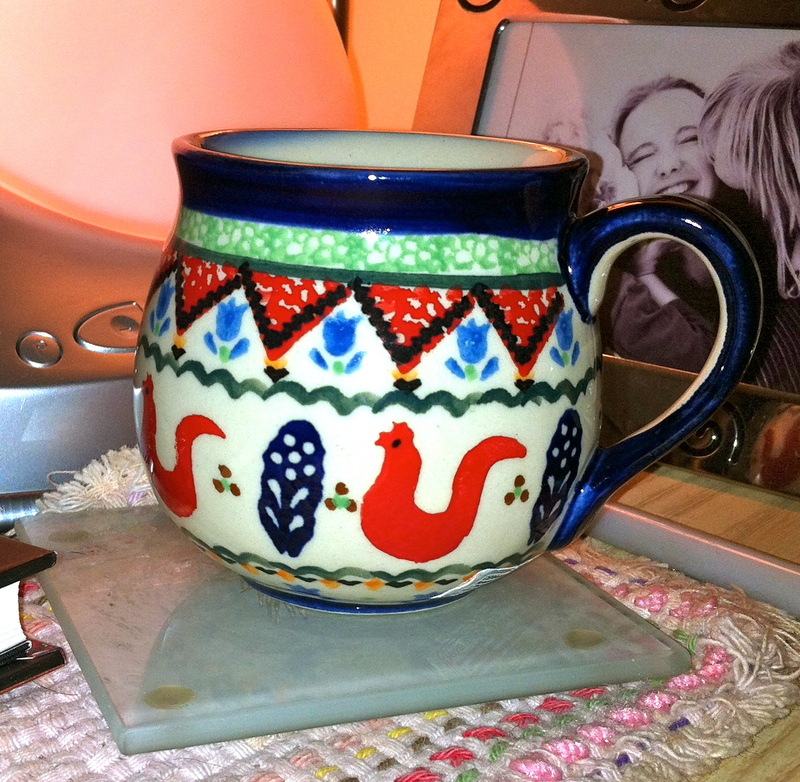 This year, I found a fabulous stall (from Hebden Bridge of all places) selling Polish earthenware pottery. The shop is Polkadot Lane, and I really defy you to click on that link and not want to buy *all* of it!! I constrained myself to the mug above, and a glorious earthenware yorkshire pudding dish, decorated with forget me nots. Tomorrow is my first morning at home since I bought the mug, and I’m sure my coffee will taste extra delicious, drunk from such a beautiful vessel!! 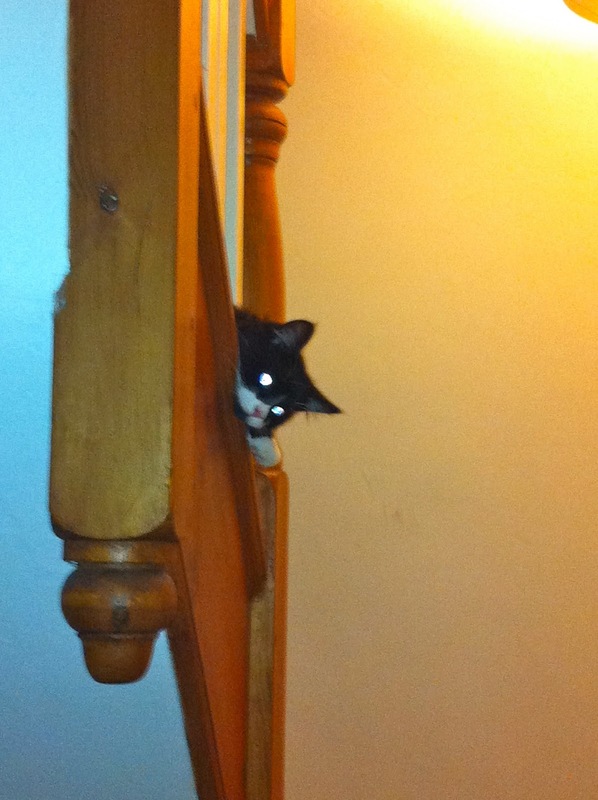 And finally, here’s an utterly gratuitous photo of one of the cats. 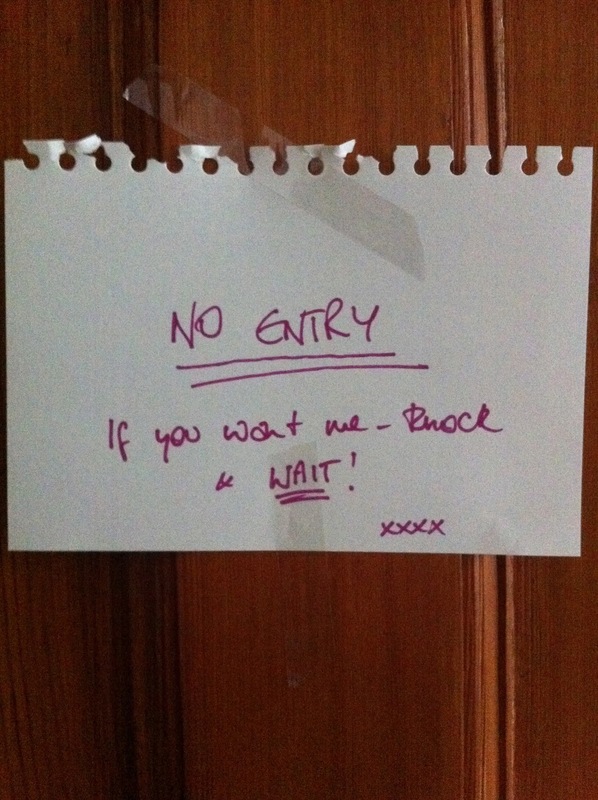 Because hell, it’s my blog and I can if I want to! !